It’s all about the cheese when you make this chicken mozzarella pasta recipe! Parmesan and two types of mozzarella blend together for just the right flavor to create a sauce that’s oh-so light. We all know how rich-tasting a heavy sauce like Alfredo can be so we wanted to come up with a better alternative. We think we hit the mark by using a combination of smoked and regular mozzarella cheese for a flavor that’s not too strong or too mild. 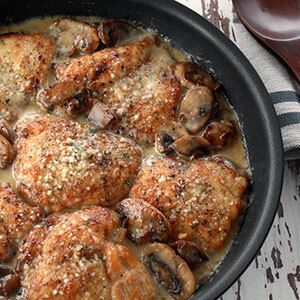 This meal is pretty easy to make and you can do it all in one pan! Bring a large pot of salted water to a boil over high heat and add rigatoni. Cook pasta until tender but still firm—about 1–2 minutes less than package instructions. Drain pasta in colander and set aside. Place a large skillet over medium-high heat and add oil. Add chicken and sprinkle with seasoned salt and pepper. Cook 4–5 minutes until lightly browned on both sides and just cooked through. Remove from skillet onto a plate and cover loosely with foil to keep warm. Return skillet to heat and add garlic to remaining oil. Add a bit more if necessary then cook 30 seconds. Add spinach and toss frequently so that it cooks evenly. Once all spinach is wilted and turns a dark green color, transfer from skillet onto the plate with chicken. Return skillet to heat and add butter. When butter is melted, add flour and stir to combine. Cook flour about 30 seconds then add milk or half-and-half, dried basil and crushed red pepper. Whisk until flour is dissolved and bring to a boil. Reduce heat to medium-low and simmer for 2–3 minutes. Begin whisking in mozzarella one small handful at a time, making sure each addition is melted before adding the next until all of the mozzarella is incorporated and sauce is smooth. Add cooked pasta, chicken and spinach into skillet and stir to coat with sauce. Add diced tomato and cook, stirring frequently, until all ingredients have re-heated and everything is well-coated in sauce. Season to taste with salt and pepper and serve with plenty of Parmesan cheese for sprinkling. Cook the chicken, spinach and sauce while the pasta is cooking to cut down on prep time.